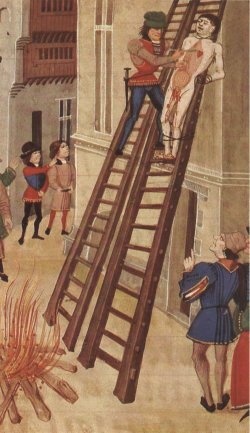 On this date in 1326, the power behind Edward II’s throne — and the presumed lover in his bed — was hanged, drawn and quartered and pointedly emasculated in a grisly public execution as the Queen and her lover took control of England. The younger Despenser, being carved up in an illustration from Froissart. Poor King Edward — that’s the swishy princeling gay-baited in Braveheart — would suffer a horrid demise of his own a few weeks later. He’s the one most conveniently read as a gay martyr. Hugh Despenser the Younger (or Hugh le Despenser) has his fans, but he’s much more likely to be taken for a villain. An upstart knight who unexpectedly lucked into a jackpot inheritance when his wife’s brother died at Bannockburn — that’s the rumble Robert the Bruce starts at the end of Braveheart — Hugh the younger parlayed his newfound position of feudal magnate into the still better gig of royal favorite. That job was open because its occupants had a distressing tendency to get dead, a fate obviously ordained for Hugh Despenser as well. But whereas Edward’s childhood pal Piers Gaveston, the murdered former fave, aroused mostly personal pique among rival nobles, Hugh Despenser meant to use his favor to rule. Despenser exploited his position to build up his wealth and control the king; with his father (you’ll never guess that he went by “the elder”), he became the de facto if never the de jure ruler of the realm. At one point, his rivals in the nobility turned the tables and got him exiled. Hugh became a pirate in the English Channel while he maneuvered his way back onto dry land in his customary most-favored-consigliere position. So although the British barons who wanted Despenser’s head were undoubtedly a distasteful lot themselves, and certainly capable of all manner of depravity in pursuit of their own crass self-interest, it doesn’t take a backwards view of human sexuality to get why Hugh Despenser would raise an early 14th century Briton’s hackles. But you have to give England this: its politics back then were a damn sight more interesting than you get today. Anyone who uses the term “bloodsport” for the modern electoral charade ought to cross cutlasses with the likes of the dread pirate Despenser. And it gets better. Meaning, for Hugh Despenser the Younger, worse. Much. Queen Isabella — that’s Sophie Marceau’s hot-for-barbarian imported princess in Braveheart — became estranged from her Hugh-lovin’ husband,* and established herself back in France with her lover Roger Mortimer. Then, the lovebirds invaded England. Edward and Hugh were so unpopular at this point that “their” nobles who should have repelled the incursion went in a landslide for the invading adulterers. Hugh Despenser’s father had already been hanged for his trouble by the time The Younger was taken; the latter tried to cheat the executioner by refusing all food and drink for days, truly a spartan image of desperate self-mortification in a rough day and age. When you get a load of the death his royal captors had worked out for him — and which they were obliged to deliver to their starving captive hurriedly in Hereford rather than more ceremoniously back in London — you can understand why. After a perfunctory trial that same morning, they tore the former favorite apart. It’s reported that Isabella and Mortimer feasted and made merry as they beheld this hideous spectacle. Now that’s bloodsport politics. Hugh the younger Despenser and his life and times are covered in amazing detail by a couple of active-posting enthusiasts of this particular period who have already been linked elsewhere in this post: the aptly-named Edward II blog (dig his biography of Hugh Despenser, among many other such dramatis personae; also his account of the execution, already cited); and, Lady Despenser’s Scribery (whose entire sidebar is pretty much all about our day’s principal; for the quick tour, see her biography and posts on the “trial” and execution). * The reason for said estrangement can be situated anywhere one likes along the personal-political spectrum; one recent historical novel speculates (upon no authority but dramatic license) that Hugh raped the queen. ** Remains reportedly discovered last year were speculatively identified as Hugh Despenser’s; the litany of injuries to the body testify to the ghastly death-ritual its owner underwent.